Coffee junkies rejoice! Premium coffee machine brand Nespresso recently relocated to Rockwell Power Plant Mall, where they opened their first official boutique. The full-scale 140 sqm space houses the latest espresso machines, coffee varieties, and a Tasting Bar to boot. Though with great coffee in iconic aluminum pods comes great responsibility. In the spirit of zero waste and sustainability, Nespresso has a global bid to its customers to recycle empty coffee pods. So if you’ve got a machine of your own, don’t throw away those capsules just yet. Put them in a bag or container and drop them off at the Nespresso boutique. But as always, there’s a need to take things further. That’s why Negrense Volunteers for Change (NVC) is in informal talks with Novateur, Nespresso’s official distributor, to reuse and upcycle used pods. As part of the foundation’s livelihood project, Artisans of Hope, Bacolod locals transform “trash” into functional—and decorative—treasure. Here’s some of the upcycled artisanal goods that they make. Every purchase directly helps each artisan and their families. All proceeds support NVC’s nutrition and education programs for children in need. Skillfully pressed and folded Nespresso pods form roses and other shapes. 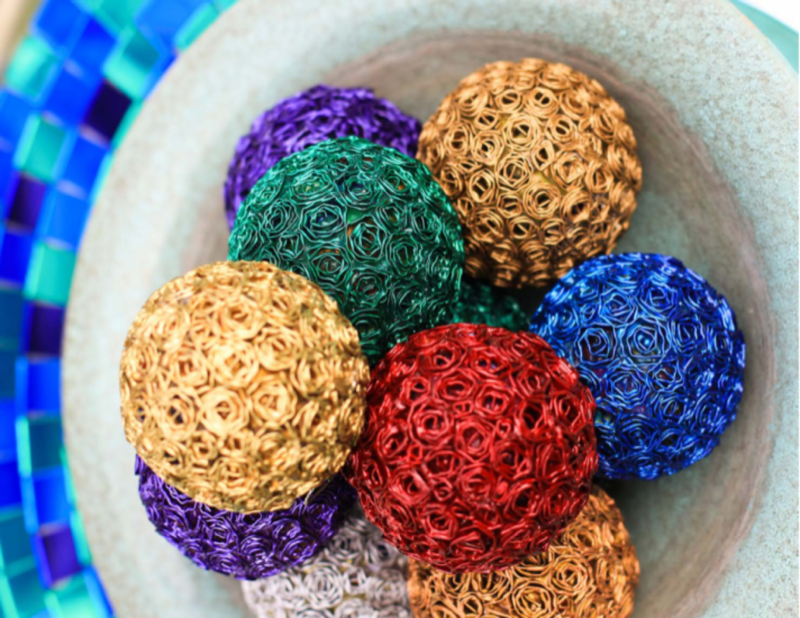 They make for vibrant accent pieces for your coffee tables or dining spaces. Each ball from their Rosa Rio collection consists of 135 Nespresso pods. The artisans also craft other designs with astral motifs. Okay, we know we’re already out of the holiday season. But you don’t need Christmas spirit to hang ornaments around the house. 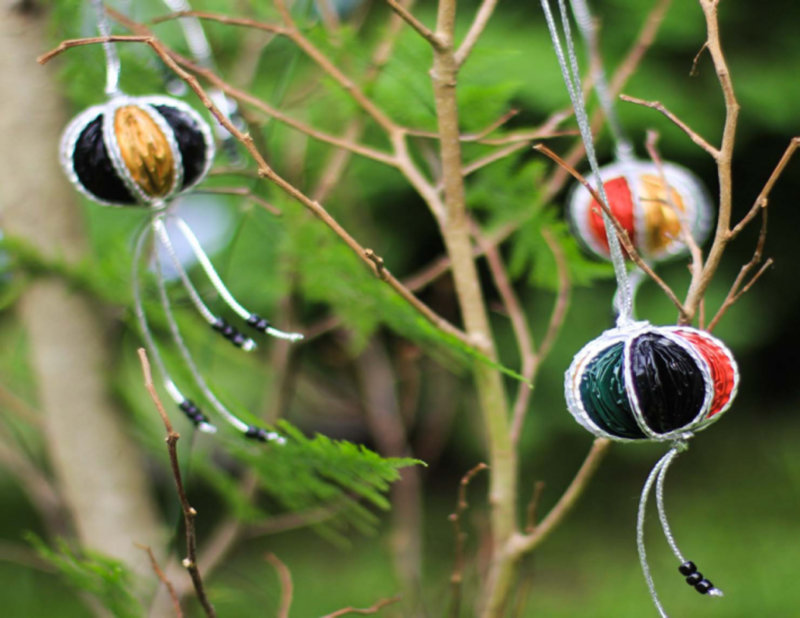 The Mabbina collection, for instance, can hang on branches in your garden or spice up your chandelier. We’re guessing it won’t look bad either hanging from your tote like a charm. Mosaic patterns add some art deco-esque flair to your dressers or cabinets. This is just another product line that Artisans of Hope offers outside the Nespresso pod line. In collaboration with furniture maker Sason Shop, the artisans meticulously arrange tile pieces on wood surfaces. Think of it as a new form of eggshell art. Check out more of their products at www.nvcfoundation-ph.org. Header image courtesy of Thomas Guignard. Photos courtesy of NVC Foundation.